For the past year, our Deputy Head of Heritage, Ross McGregor, has been undertaking a research project with Dr. Cheryl McGeachan, a lecturer in Human Geography at the University of Glasgow. The project, funded by the Carnegie Trust, focuses on 3 Scottish police surgeons spanning three cities in the 19th century. This includes one of the first police surgeons in Scotland, Dr Francis Ogston, who served with the Aberdeen City Police from 1830 – 1880. Sir Henry Duncan Littlejohn, commonly known as one of the inspirations behind Arthur Conan Doyle’s famous character Sherlock Holmes, was police surgeon for the city of Edinburgh from 1855 – 1908 and became the first Chair of Medical Forensics at the University of Edinburgh. Finally, Sir William Macewen, a pioneering Scottish surgeon, spent his early years as a police surgeon for Glasgow City police, 1871 – 1875. The focus for the project in Glasgow centres on the College’s archives collections of William Macewen (RCPSG 10). These collections include Macewen’s personal scrapbook of newspaper clippings, published articles, medical photographs, and many more. To provide more access to the Macewen collection within the College’s archives, an animation was created to visualise a particular case that Macewen attended to in 1873. 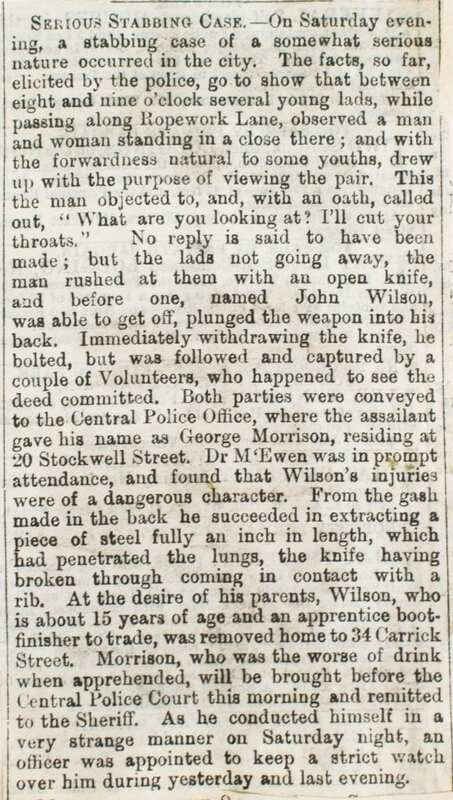 A young boy, John Wilson, had been stabbed in the back (literally) by a man in Ropework Lane, near Glasgow’s St. Enoch Centre. The boy was taken to the Central Police Office on Bell Street and was seen to by Macewen. 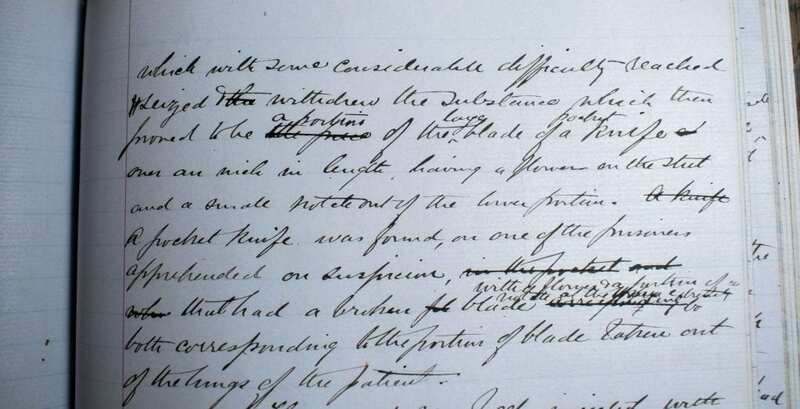 We find this case in one of Macewen’s surgical casebooks, where he details the state of the knife wound as well as the boy’s symptoms. Upon examination, it was found that a fragment of the knife remained embedded in the boy’s lung, which Macewen successfully removed under antiseptic conditions. The notes within Macewen’s casebook were used to form the narrative of the animation created visualise this case. This visualisation product will add another level of interpretation and access to the College’s archives for all.